3 for Intelligence: 6th Edition Orks - Nobs = Nerfed! I am going over the 6th edition rules changes and I am finding that hammer unit of Codex: Orks is simply getting the nerfstick. What does that mean for Orks? Other builds are very viable still. Kan Wall takes a pretty big hit, as cover saves will be 5+ instead of 4+. Speed Freaks seems a lot better, as bike are getting some love, not the Nob Biker Death Star is still impacted the same way Battle Wagon Nobs are. Green tide, I think is a whole lot stronger, as you can join units together. MEGA GREEN TIDE!!!!! The fact that weirdboys now have psychic defense along with the change powers may make them viable… I will have to math have to math hammer and practice a game to tell for sure. Overall I think the change in rules is bad for orks, and specifically, wound allocation shenanigan nobs. 1. Wound Allocation Nerf! Wound allocation is based on armor, not unique configurations, so you have 3 groups. 6+ 4+ and 5++. So instead of having each induviual model in a wound allocation group, you now have 3 groups. This is what made them good!!! 2. Patch up – every turn you kill off excess wounds, thus killing off models!! WTF!! 3. Hull Breaches – Cumulative effects of stunning and weapon destroyed eliminate your BW Faster. This is a very bad thing! Critical hits are auto pens on your AV 14 front. 4. Waagh Banner no longer gives +1 WS, the way the codex update is laid out, it appears that they took off the +1 WS, making it useless instead of awesome! The unit still packs a lot of punch, but with low initiative and striking last with Klaws, this unit will go from a take all comers machine to a tool you have to use very carefully, and definitely not as powerful as it used to be. So what do you guys think? I guess paladins are a little worse off when it comes to this nerf. Is this what the game needed? 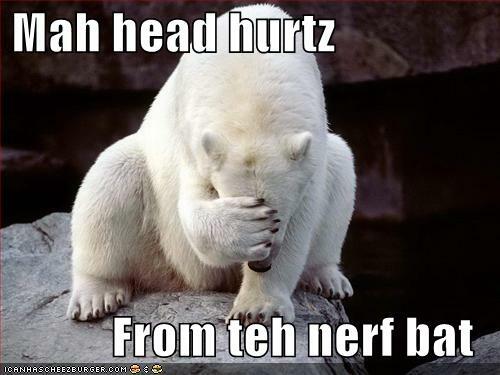 Nerf Polar bears! They are op! Also, play LOU! That's what I learned from this post. 1. We still don't know if the leaked rules are legit or not. 1. True, but it's fun to conjecture. 2. Right, they are one of the older codexes, but they are still pretty competitive overall. With the shift into the potential 6th edition rules, a lot of their strategies may get shut down. Codex orks hasnt been mentioned in the 2012 schedule, it may be early 2013, but I make no assumptions. Also, the leaked 6th rules have a decent amount of credibility as others have pointed out, but only time will tell.